Cut the avocados in half, remove the pits and then scoop out the insides with a spoon, leaving them as whole as you can. Mash ONE avocado – trust me, this is the secret to making this perfect! Cut the remaining two avocados into chunks, I usually do it around 1/3 of an inch. Make sure they are a good size for scooping, not too large! 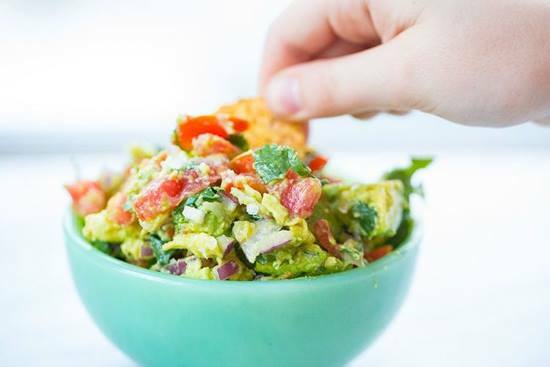 Place the MASHED avocado in a medium bowl. Add in the red onion, tomatoes, garlic, lime juice and cilantro. IF you are using jalapeno or cumin, add them now as well. Mix together well. Once this is combined,add in the avocado chunks. Mix until they are coated. Add in the sea salt to taste – I always use more, I LOVE it salty! Add more lime juice at this point as well, to taste. Serve right away, or refrigerate for an hour or two.